Sinningia barbata, here with the corolla removed, has two dorsal (top) nectaries, the others having been reduced to invisibility. A nectary is normally developed between stamens and ovary. It can be assumed that the flowers of Gesneriaceae are primarily nectar flowers and that the (rather rare) lack of a nectary is a phylogenetically derived condition. As floral ontogeny, floral anatomy, and the “adnate” nectary of the Coronantheroid Gesneriaceae demonstrate, the nectary is an enation of the ovary base and not of receptacular origin or a transformed inner stamen whorl. There are a great variety of nectary forms. In the complete form it is cylindrical, cup- or ring-shaped, occasionally with shallow lobes at the rim. In the paleotropical Gesneriaceae this is by far the prevailing form and other types are rare. 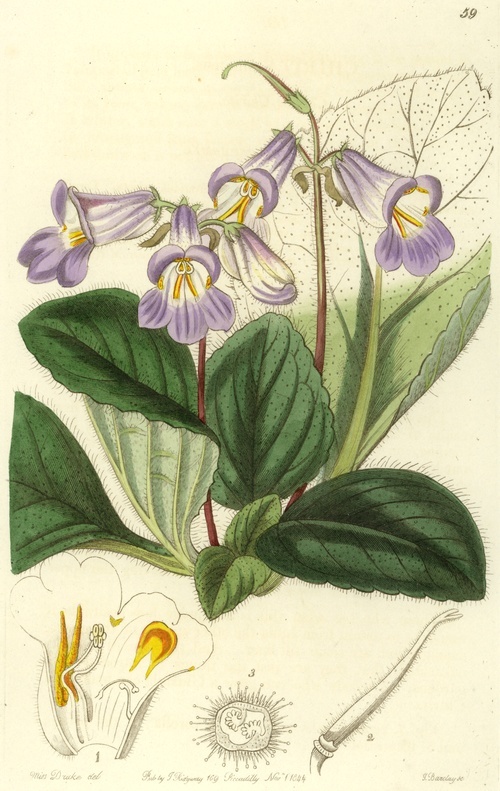 In the Coronantheroid Gesneriaceae (Gesnerioideae-Coronanthereae) the nectary is also complete, but adnate to (or embedded in) the ovary base. In the neotropical Gesneriaceae (Gesnerioideae-Beslerieae, G.-Napeantheae, G.-Gesnerieae) only a dozen of the genera have a ring-shaped nectary; in the others it is strongly modified. Two evolutionary lines can be observed: (1) Beslerieae: complete ring » dorsally thickened ring » semi-annular structure » dorsal gland. (2) Gloxinieae (Gesnerieae-Gloxiniinae), Sinningieae (Gesnerieae-Ligeriinae) and Episcieae (Gesnerieae-Columneinae): ring » 5-lobed ring » 5 separate glands of equal size » 5 glands of unequal size (the two dorsal ones enlarged) » connation of the dorsal and step-wise reduction of the lateral and ventral glands » single dorsal gland. The nectary shape is of great importance in defining genera (Wiehler 1983). Both in the paleo- and neotropical Gesneriaceae there are taxa in which the nectary is rudimentary (non-functional) or completely reduced (in pollen-flowers, deceptive pollen flowers and perfume-flowers, see Pollination). Primulina dryas, published as Chirita sinensis in Edwards’s Botanical Register (1844). Visible in the details are a fused stamen pair, staminodes and the ovary cross-section with carpels. Note the yellow nectar guides in the flowers. The ovary consists of two fused median carpels. At the top it bears the style and the stigma. The stigma may be inconspicuous (with a small area of stigmatic papillae at the style tip), distinctly capitate (head-shaped), stomatomorphic (mouth-shaped, with short upper and lower lip) or bilobed. Under the latter term, quite a number of different types must be distinguished. The position of the lobes may be median or lateral, with both or only the anterior carpel forming the two lobes. A style is always present, though it may be short in some cases. It may be straight or gently curved. 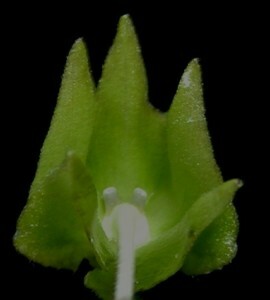 In flowers with a distinct tube it is usually held immediately below the corolla roof. In some species of erstwhile Chirita (now Henckelia) and others, it is held in a stable position between two flaps of the corolla roof. Position may be central or in the case of enantiostyly, lateral. The outer shape of the ovary varies from (rarely) disc-like through globose, ovoid or elongated to long-cylindrical. In the long forms sometimes a narrow, tapering “stipe” (basal ovary part with sterile placentae) is present (species of Didymocarpus and Aeschynanthus). Usually the two carpels are developed equally, but there are exceptions in some East Asian taxa, in which the anterior carpel is much reduced and sterile: Hemiboea, Briggsiopsis, Metabriggsia (now sunk in Hemiboea), Deinostigma, and some species of Chirita (now sunk in Henckelia). Ovary position may be roughly classified into superior, semi-inferior and inferior. Distinctly semi-inferior and completely inferior ovaries (including many transitional forms) occur only in the neotropical Gesneriaceae; slight sinkage into the receptacle is found in the other groups as well. Genera with superior, semi-inferior and inferior ovaries are found side by side in the Gloxinieae (Gesnerieae-Gloxiniinae) and in the Sinningieae (Gesnerieae-Ligeriinae), almost superior to fully inferior ovaries even in a single genus (Sinningia). Position and shape of placentae (the tissue supporting the ovules) is of great taxonomic importance. The form of the individual placentae (in cross-section) can be roughly classified into two types. In the Didymocarpoid Gesneriaceae (Didymocarpoideae) they are rather thin, of equal thickness throughout their length (lamelliform), and curved back in the distal part. Especially in Aeschynanthus and allies, lamellae are long and markedly revolute. The production of ovules is usually confined to the distal reflexed parts, sometimes even to the very ends. The second type, occurring in the rest of the family, is that of a (roughly) right-angled triangle, with ovules mostly being produced on all sides. Variation relates to the shape of the placenta (e.g., more rounded) and to the restriction of ovule production to the inner (e.g. species of Columnea, Chrysothemis) or outer (e.g. Achimenes candida) surface of the placentae.